The new Bishop of Hereford has carried out his first official engagement in Shropshire. Bishop Anthony Priddis, 55, was inaugurated at a special service at Hereford Cathedral on Saturday. He travelled to St Michael's Church in Madeley, Telford, which is the northern tip of his diocese, to conduct part of a traditional Sunday service. Members from Madeley Baptist Church and Springfield Christian Fellowship joined him. Congregations from Sutton Hill and Woodside were also at the service. 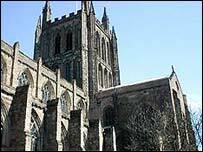 The Diocese of Hereford was founded in 676 and covers the whole of the county of Herefordshire, southern Shropshire and a few parishes in Worcestershire, Powys and Monmouthshire. Bishop Priddis, a married father-of-three, took up his new position in March. The Church of England externally advertised the vacant bishop's position for the first time in its 470-year history. Bishop Priddis, who is a trained biochemist, spent most of his career in the Oxford Diocese. He was made an honorary canon of Oxford Cathedral in 1995.